Social Work Month's theme reflects the unique dedication social workers have to exploring and addressing the social and environmental challenges that can cause trauma in people's lives and the profession's long-standing commitment to developing leaders who promote social change and social justice. Every serious student of social work history has heard the tale: In the late 19th and early 20th centuries, social work emerged as an occupation in Europe and North America and, by the 1920s, was considered a profession. Settlement houses were established in large cities in the United States during the 1880s. Jane Addams and Ellen Gates Starr founded Chicago's Hull House, the most famous settlement in the United States, in 1889 after a visit to London's Toynbee Hall, the world's first settlement house. Over time, social work's earliest pioneers—also including Florence Kelley, Alice Hamilton, Julia Lathrop, Sophonisba Breckinridge, and Grace and Edith Abbott, among others—laid the foundational bricks in the profession's long and winding pathway. These visionary women had one key quality in common: They were leaders. Reading about their pioneering work has inspired me throughout my career. They created a number of remarkably innovative social programs, including the Immigrants' Protective League, the Juvenile Protective Association, the first juvenile court in the nation, and a juvenile psychiatric clinic. In addition, they helped convince the Illinois legislature to enact protective legislation for women and children, child labor laws, and compulsory education laws. Over time, social work leaders broadened the profession's ken to include more clinically oriented services. During World War I, the Red Cross Home Service organized assistance to soldiers and other service personnel and their families. Mary Richmond, another social work lodestar best known for her groundbreaking writings on social casework, trained Red Cross Home Service workers. Other war-related charities and services that depended on social workers also expanded. The army used social workers, many of whom were Red Cross personnel tied to army units in the field, to help injured soldiers who struggled with psychological and neurological challenges. Smith College established its School for Social Work in 1918 as a wartime initiative. Graduates provided services to soldiers and veterans suffering from "shell shock" and other psychiatric disabilities. Social work is only one of many venerable helping professions. Our colleagues in the professions of psychology, psychiatry, mental health counseling, marriage and family therapy, and psychiatric nursing share social work's commitment to assisting people who have difficulty navigating and coping with life's challenges. But what is truly unique to social work is the profession's enduring commitment to developing leaders who promote social change and social justice. From day one, social workers are taught to understand and address the complex intersection between individuals' private troubles and the public issues that surround them. Social workers understand that a client's protracted clinical depression may be affected by draconian housing policies that have left him homeless. Social workers understand that a client's substance use may be a consequence of antiquated domestic violence laws that have exposed her to relentless risk. Social workers understand that a client's disabling anxiety symptoms may stem from her job loss resulting from a weak economy. In short, social workers understand that they must explore and address the structural and environmental challenges that cause trauma in people's lives. That is social work, and it is this commitment to leadership and activism that distinguishes this noble profession. It is also the commitment that NASW celebrates during this year's official Social Work Month. "The primary mission of the social work profession is to enhance human well-being and help meet the basic human needs of all people, with particular attention to the needs and empowerment of people who are vulnerable, oppressed, and living in poverty. A historic and defining feature of social work is the profession's focus on individual well-being in a social context and the well-being of society. Fundamental to social work is attention to the environmental forces that create, contribute to, and address problems in living. Social workers promote social justice and social change with and on behalf of clients. "Social workers pursue social change, particularly with and on behalf of vulnerable and oppressed individuals and groups of people. Social workers' social change efforts are focused primarily on issues of poverty, unemployment, discrimination, and other forms of social injustice. These activities seek to promote sensitivity to and knowledge about oppression and cultural and ethnic diversity. Social workers strive to ensure access to needed information, services, and resources; equality of opportunity; and meaningful participation in decision-making for all people." Since social work's earliest years, a long line of professionals has embraced this deep-seated mission and served as inspiring role models for what it means to be a social work leader. NASW dubs them Social Work Pioneers. Learning about them and their profound contributions has helped me understand and appreciate what true leadership is. Eveline Burns (1900–1985), for example, was one of the pioneers of the Social Security Act, which is such an essential component of the social welfare system in the United States. Burns helped shape the nation's public assistance and work programs as they developed in the 1940s. Also during social work's earliest years, Frances Perkins (1880–1965) worked in settlement houses in Philadelphia and at Hull House in Chicago. After working in various social work positions, Perkins was selected by New York Governor Al Smith as the first woman to serve on the New York State Industrial Commission. She was then appointed U.S. Secretary of Labor by President Franklin Delano Roosevelt, becoming the first female Cabinet member in the United States. More recently, former U.S. Senator Barbara Mikulski (1936–) began her political career by using her social work skills to organize neighbors to stop construction of a highway through a historic section of Baltimore. Mikulski was the first Democratic woman to serve in both houses of Congress, and the first woman to win a statewide election in Maryland. A contemporary of Mikulski's, Whitney Young, Jr. (1921–1971) worked with the Urban League in Minnesota after receiving his MSW. Eventually he became executive director of the National Urban League, remaining there until his death. Young devoted his career to challenging discrimination against blacks and poor people. And the list of social work leaders goes on. Of course, legions of other social workers have exemplified leadership more quietly and with less national fanfare. They are no less worthy of note and appreciation. • A midwestern social worker recognized the need to assist victims of human trafficking in her local community. She convened social work colleagues, trauma specialists, community activists, law enforcement officials, child welfare professionals, and other community members to brainstorm plans. The group now is well on its way to creating a safe home for survivors. • A recent social work school graduate was concerned about the epidemic of opioid overdose deaths in her community. She used her recently acquired research skills to document the problem's prevalence and applied to a local foundation for funds to develop a novel hospital-based prevention and intervention program. The newly minted social worker implemented an evidence-based protocol that recruits and trains people in recovery to serve as coaches who reach out to and collaborate with patients admitted to hospital emergency departments. • A New England social worker provides outreach services to people who struggle with homelessness. She is determined to develop comprehensive interdisciplinary services to meet these individuals' needs. The social worker spearheaded an effort to bring together a group of physicians, nurses, social workers, and lawyers to develop a truly collaborative approach. In addition to organizing concrete outreach health, mental health, substance use, legal, and housing services, the social worker facilitates monthly meetings of practitioners from diverse professions, along with service users, to review and discuss relevant research and intervention models. • A recently retired social worker was inspired to use his 40-plus years of experience to continue assisting vulnerable people as a volunteer. He joined forces with a prominent "free" health care clinic—staffed entirely by volunteer doctors, nurses, medical assistants, and other professionals—to organize and deliver social work services to people who do not have health insurance, including undocumented immigrants. The social worker devotes hours to the clinic every week, consistent with the NASW Code of Ethics principle endorsing provision of pro bono services; he also serves as a field instructor for students who work at the clinic as interns. This mere cross-section of social work luminaries provides rich exemplars of what it means to be a social work leader committed to activism and social justice. But what does it take to be such a leader? Decades' worth of ambitious research suggest that the most effective leaders possess certain qualities. In a compelling recent study published in Harvard Business Review, Giles (2016) reports on the results of surveys she conducted with 195 leaders spanning 15 countries and 30 global organizations. Participants were asked to choose the 15 most important leadership competencies from a list of 74. The most important quality from this long list was "has high ethical and moral standards." Another major study (Lipman, 2016), conducted by Robert Half International, surveyed workers and top-tier administrators. Despite their different roles, both groups placed "integrity" at the top of their lists, followed by "fairness." In a major social work study, Rank and Hutchinson (2000) investigated how individuals in leadership positions within NASW and the Council on Social Work Education perceive social work leadership. They surveyed a random sample of 75 deans of social work schools and 75 executive directors and presidents of social work organizations. The researchers explored leadership within the social work profession and identified how social work leadership is distinctive from leadership in other professions. A key finding was that the most effective leaders act with integrity and trust. Clearly, a consistent finding in research on leadership is that ethics and morality matter. Leaders can demonstrate their commitment to ethics and integrity in two principal ways. First, leaders can avoid engaging in unethical conduct, such as financial fraud, deceptive marketing, conflicts of interest, and falsification of records. Those are what ethicists label acts of omission. But the more noble application of ethics in leadership is by commission, that is, the active and deliberate pursuit of ethically based ideals, otherwise known as aspirational ethics. Leadership in social work must be more about honoring the profession's commitment to challenging injustice and promoting justice than about avoiding unethical conduct. Leadership in social work means honoring the NASW Code of Ethics mandate to "advocate for living conditions conducive to the fulfillment of basic human needs and … promote social, economic, political, and cultural values and institutions that are compatible with the realization of social justice" and "engage in social and political action that seeks to ensure that all people have equal access to the resources, employment, services, and opportunities they require to meet their basic human needs and to develop fully." That is what social work champions do. True leadership in social work requires moral courage, a concept rooted in the German concept of Zivilcourage, which entails a willingness to challenge authority and, when necessary, take on unpopular causes in the name of justice (Comer & Vega, 2011; Kidder, 2006; Osswald, Greitemeyer, Fischer, & Frey, 2010; Pianalto, 2012; Strom-Gottfried, 2016). In their efforts to define moral courage, Kidder and Bracy (2001) ask a question whose answer has profound implications for social work leadership: "What, then, is moral courage? It can be defined as the quality of mind and spirit that enables one to face up to ethical dilemmas and moral wrongdoings firmly and confidently, without flinching or retreating. … It enables us to 'face up' to problems—not necessarily to resolve them, and certainly not to promise that we will master them, but to address them squarely, frontally, and with determination. … It requires action that is both firm in its persistence and confident that its tools—the moral, mental, and emotional elements of argumentation and persuasion—are sound enough to weather serious resistance." For more than a century, the social work profession has been filled with morally courageous leaders who have used their passion and values-based determination to challenge oppression, injustice, poverty, and exploitation. Today's social workers can witness moral courage firsthand, for example, in the form of Irshad Manji's inspiring leadership of the Moral Courage Project based at the University of Southern California. Started initially at New York University, the Moral Courage Project seeks to teach emerging leaders to mount values-driven initiatives. For social workers, moral courage entails identifying social injustice in our world, rallying colleagues and the citizenry to confront it, and inspiring them to sustain the effort over time. Moral courage often entails risk, especially the risk of opposition and failure. This is risk that social work demands in the name of social justice. Comer, D. R., & Vega, G. (Eds.). (2011). Moral courage in organizations: Doing the right thing at work. Armonk, NY: M.E. Sharpe. Giles, S. (March 15, 2016). The most important leadership competencies, according to leaders around the world. Harvard Business Review. Retrieved from https://hbr.org/2016/03/the-most-important-leadership-competencies-according-to-leaders-around-the-world. Kidder, R. M. (2006). Moral courage. New York, NY: Harper. Kidder, R. M., & Bracy, M. (2001). Moral courage: A white paper. Retrieved from https://ww2.faulkner.edu/admin/websites/jfarrell/moral_courage_11-03-2001.pdf. Lipman, V. (October 25, 2016). The most important leadership attribute? New study has clear answer. Forbes. Retrieved from https://www.forbes.com/sites/victorlipman/2016/10/25/the-most-important-leadership-attribute-new-study-has-clear-answer/#531269264df2. National Association of Social Workers. (2018). NASW code of ethics. Washington, DC: National Association of Social Workers. Osswald, S., Greitemeyer, T., Fischer, P., & Frey, D. (2010). What is moral courage? Definition, explication, and classification of a complex construct. In C. L. S. Purey & S. J. Lopez (Eds. ), The psychology of courage: Modern research on an ancient virtue. (pp. 149-164) Washingon, DC: American Psychological Association. Pianalto, M. (2012). Moral courage and facing others. International Journal of Philosophical Studies, 20(2), 165-184. Rank, M. G., & Hutchinson, W. S. (2000). 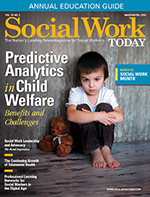 An analysis of leadership within the social work profession. Journal of Social Work Education, 36(3), 487-502. Strom-Gottfried, K. (2016). Moral courage. In A. J. Viera & R. Kramer (Eds.) Management and leadership skills for medical faculty: A practical handbook. (pp. 183-190). New York, NY: Springer.